So just when we thought we had it all covered with Ashtanga, Kundalini, Anusara (sigh), Sivananda, Bikram, Yogalates […], there’s another yoga coming our way: BROGA. Yes, it’s yoga, but this time guys only are allowed into the yoga room. The media have been all over it, with TIME letting go a sigh of relief: “Finally, yoga for dudes”, and The Week saying: “No-shame yoga for men”. Bear with me, but there’s something I don’t quite get. Isn’t there something wrong with the basics? What is yoga? Well, if we believe Patanjali, who knew a thing or two about yoga (not about broga, though…), he says in the Yoga Sutras that yoga means to follow the eight limbs or steps to quiet the mind and achieve kaivalya (ultimate freedom). I looked everywhere but couldn’t find any reference to “core muscles”, “muscle-toning” and “cardio-working”. If the statement above is true – how can this be different for men and women? Become men enlightened in a different way? Is their road to liberation a different one? Is not the nature of the mind the same, no matter if man or woman? The philosophy of Yoga itself is very vast and even a lifetime would be short to cover every aspect of it. How come these new branded yoga emerge to mislead people. Yoga doesnt differentiate between sexes. Just doing some physical postures is not Yoga. I guess a new “brand” of yoga gives you a new angle in terms of marketing. If it’s “new” people will want to try it out. Expanding on LilaBlog’s comment: once upon a time there was nothing but ‘broga’: transcendence has historically been a male project. The inclusion of women on the path of yoga is a very modern adaptation to modernity within the yoga tradition. To offer an answer to your questions, I think that the ultimate goal of yoga is the same for men and women but the means to arrive at that goal will be different according to the essential natures of men and women respectively. The general nature of the mind is the same for any embodied being but the details differ greatly between male and female: ‘equal’ is not the same as ‘same’. Therefore men and women take different, complimentary roads to enlightenment. That said, I suspect that we’re talking about two different things at the same time: Men who are interested in Patanjali’s system of yoga are not the target market for a ‘Broga’ class. The main reason that most men who would like to do yoga don’t is precisely because the classes are filled with women who are better at it than they are. Therefore the apparent hook of being in a room filled with gorgeous sweaty women backfires as a marketing ploy. I would be pleasantly surprised if any gentleman attending a ‘Broga’ class is the least bit interested in Patanjali’s conception of yoga: I think it far more likely that they are merely interested in developing an asana practice in an environment where they – and their egos – feel safe; where the power dynamics are tilted back to more familiar territory. Keep up the good work! Thank you for being authentic! Gee, is that an ego I see in Broga? Isn’t the whole concept of stylized yoga based on someones ego otherwise we would all do Yoga and call it just that. Funny that yoga was traditionally and primarily a men-only activity but now the table has turned so totally that someone feels the need to market yoga with a silly name “just for dudes” so that men feel like they “belong” in the yoga world…. that’s irony for ya. I particularly like the last point you made 🙂 I’m definitely torn on this one. One of the things that I think has always bothered me about yoga is that it seems like in the western world we’ve turned what is intended to be a deeply spiritual and meditative practice into just another exercise trend to end up looking hot in a bikini. How many people do yoga because of what it does for their soul? And how many do it because of how it makes them look? Just something that’s always kind of bugged me about yoga in America. This Brogi stuff seems like the ultimate example of that. On the other hand, maybe I shouldn’t be so judgmental. Everybody does yoga for their own personal reasons and who am I to claim to know what those reasons are. And maybe adding the incentive that it will tone your body, help you lose weight, and be “dude friendly” is just a means to an end. It’s better to do it at all right? Even if it’s not necessarily for the most ideal reasons. I don’t have the answers, that’s for sure, but thanks for starting the discussion! I especially love the name! “Broga” – Hah! Haha, the whole idea seems a little silly. And you’re right, all those pretty ladies in tight pants is part of the appeal for the average dude (at least the one’s that I know that are willing to give yoga a try). But at the end of the day, whatever gives them thier first little taste towards true yoga is better than nothing. In this day and age, marketing is essential to attract the customer or client one wants. As a guy, I know there is still a cultural hesitance among males to consider yoga as worthwhile to pursue. I was drawn to it initially as complement to my physical exercise regimen that provided great stretching benefits, and maybe, another way to deal with stress. But it does not have the allure that “normal” exercise and activities have that attract most men, typically, strength development, cardio enhancing and just a plain good sweat workout. Broga to me is a marketing ploy to attract more (new) males to yoga who hopefully will become enamored with the the greater “yoga” that exists, just like it happened to me. Having a male-only class to me seems to me a way to eliminate the feminine aspect of yoga which may be a turn-off for a man thinking about trying yoga. I think once a “brogi” gets “yoga” and takes a regular yoga class with females, of which many are attractive, they may broaden their yoga class selections. Eventually, as we practice the yama of Bramacharya, that becomes less of a concern or need or want. Yoga started out as a ‘guys only thing’ if I correctly read/remember. Women have gyms and classes devoted to their gender, and if guys want some ‘guy time’ that’s alright. No matter the class staying present matters no matter the gender. In the West, I guess, we tend to be a bit fickle and love new fads. . . We’ll have to wait and see if Broga can manage to play and keep up with the “big boys” like Ashtanga, Anusara, etc. 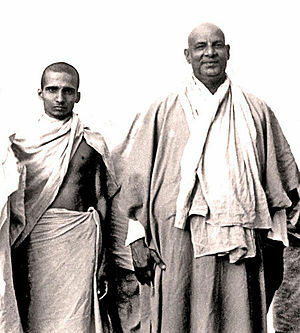 On the other hand, I also believe that we all have our own unique path to follow in order to reach kaivalya, and for some that may mean joining a Broga class. Then again, as women, we’ll never know, as we won’t be allowed in. I’m not sure whether I love or hate the fact that it’s called ‘Broga’…! I don’t think yoga needs that kind of segregation, but I suppose, in a way similar to women being intimidated at a gym filled with sweaty men, men might feel a bit intimidated in a room filled with bendy women. That said, my class is almost 50/50 men and women and no one seems at all bothered by attending a mixed gender class – and so it should be. In yoga we look inside, not to the person next to us, so this seems like someone trying to cash in on some kind of trend to me. To each his own, I suppose! But like you, I can’t see any guy willingly joining a room filled with sweaty men instead of hanging out with a bunch of women in tight-fitting yoga pants! Hmmmm…. I’ve been practicing Yoga for over 15 years and it amazes me how nichey and mainstream yoga is becoming day by day. Although I believe in niches, as one who targets teaching yoga to adolescents myself, I absolutely hate how westernernized yoga has become. I was asked some time ago by a guy who does weight lifting to teach what he felt should be called “Dude Yoga”, I didn’t judge him, as I figured he was one who felt inferior in a place not all too common to many and i reassured him what yoga is about. I since had asked fellow men who come to my classes regularly what they thought of yoga for men and ALL of them replied the same thing, “Why would I wanna be in a room filled with a bunch of sweaty guys! ?” When you target muscle strength, aerobic activity and strenuous workout, it tends to leave the “meditation in motion” aspect out of it and turns yoga into something only physical which is not what yoga is about. Hmm, totally agree with you Andrea. What I would say though, is that I teach a class of rugby-playing guys who are all training for an Ironman triathlon (they are mad). They’re all mates and I think the fact that they’re all equally tight hamstringed, tight hipped, struggling to sit up straight as they cycle too much etc means that they have a sense of togetherness and cameraderie. There’s one girl in the class and she has more open hips and she just naturally manages to do a lot of the postures without the huffing and puffed (and effing and blinding) that the guys do. They look on and gawp. I guess there is a market for it, and–even when it comes to something like yoga (which in an ideal world would be above such matters)–the market dictates the offerings. It would be interesting to hear from a guy who attends these classes to learn what motivated him to take them, and whether they really meet his needs better than classes also attended by women.